​In this article, we short-list the top shoulder braces that are currently on the market. Our aim is to provide you with the essential information needed to decide which is the best shoulder brace for your needs. The shoulder is more prone to injury than other joints in our bodies given its great flexibility. While you can use ice and enough rest to reduce inflammation and ensure that an injury does not get worse, wearing the best shoulder brace will hasten the recovery period and prevent chances of more injuries. Even better, a good shoulder support will help you go about your normal routine without much hassle. There is an increase in the number of people using shoulder braces and a consequent increase in shoulder brace brands. This has posed a challenge especially to first time buyers who majorly rely on consumer shoulder brace reviews without the slightest idea of what to look for in a shoulder brace. We have rounded up the top shoulder supports and a guide to help you get through the shopping process. Why Do You Need a Shoulder Brace? 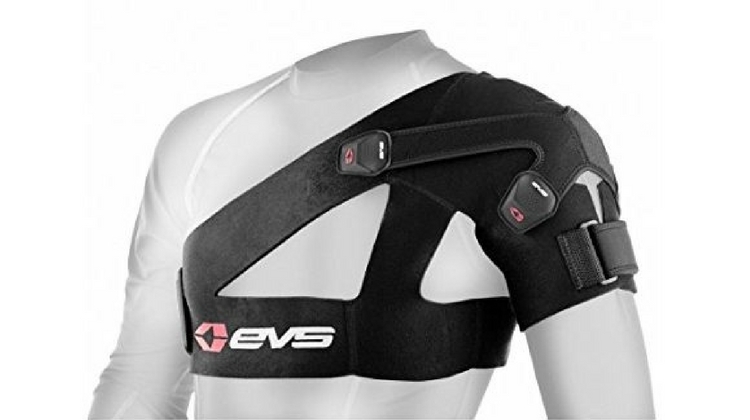 The EVS Sports SB03 Shoulder Brace was created to relieve shoulder pains after an injury and hasten the recovery period. Originally, the brace was created to manage rotator cuff injuries but it has been used to manage almost all types of shoulder injuries and damages. It is unique from other braces in that it is offered with three securing straps of varying lengths. With a vented neoprene material, which acts as a synthetic rubber, the brace is able to retain heat to a therapeutic level to manage injuries and pain. Neoprene is breathable to keep this brace comfortable in hot weather and wick moisture away to prevent build-up of sweat. Therefore, the brace does not result to any known skin reactions. This ventilated design also helps reduce build-up of bacteria and odors. For custom fit, EVS Sports SB03 Shoulder Brace is offered with an adjustable arm closure which is combined with TPR gripper pull tabs to lighten the task of adjusting the brace to fit. The arm closure also reduces underarm chaffing, a skin reaction common with the use of many shoulder braces. You can adjust the compression of the brace based on your shoulder injury or pain. The brace’s exceptional strap system keeps the shoulder in position without stopping movement. Granted, the brace is ideal during heavy lifting to prevent injuries. The brace is offered in four sizes to cover 30-inch to 48-inch chests and weighs four pounds. Reviewers on Amazon.com like the great stabilization, the great support and the overall comfort that this brace offers. According to consumers, the brace is effective in relieving pain and managing injuries. However, a couple of reviewers cite that they find it hard to strap the brace into position without assistance. NatraCure has produced a ThermoActive line of braces to offer support and soothe injuries to relive pain and promote quick recovery. The hot/cold and compression brace technology allows shoulder brace users to choose the relief they need based on their injury or amount of pain. Here, you can choose cold, hot or compression therapy as the name of the brace suggests. To offer these, the brace is equipped with built-in air pumps that produce adjustable compression while the internal gel pack of the brace can be heated in a microwave or chilled in a freezer for heat or cold therapy respectively. ThermoActive shoulder support helps relieve brace users of aching pain. Even better, when used with a second gel pack, the brace can alternate between hot and cold therapy for better pain relief. This makes it ideal for injury recovery, physical therapy, management of chronic conditions such as arthritis and for use before and after sports. You will be required to use this brace for less than 20 minutes. The brace can fit up to 50-inch chests, and up to 60-inch chest circumference if with extender straps. There are both right and left shoulder straps, or a universal type. The gel pack and the air pumps are removable allowing you to wash and reuse the brace. You may need to use an interface, preferably a fabric or a paper towel, between the gel pack and your skin when doing cold or hot therapy. Lots of reviewers on Amazon.com have applauded this product with most saying it delivers as advertised. The reviewers are comfortable with the sizing of the brace, the style and the adjustability of the brace. However, a couple of reviewers have complained of the bulkiness of the brace and the fact that you have to put in a microwave or freezer giving you more work while you could just strap it on your shoulder. Yosoo Shoulder Brace was created for athletes who need to constantly use the shoulder joint including those active in basketball, swimming, volleyball and weightlifting. It is a simple and non-surgical shoulder support which stabilizes and protects the shoulder joints during a sporting activity or afterwards to help the shoulder recover from an injury and ease any discomfort. The brace works by increasing blood flow to the injured area. The brace is created with a breathable neoprene fabric that offers the right amount of therapeutic heat. This makes the brace effective in alleviating pain and still comfortable enough to wear during hot weather. For custom fit, the brace is designed with two premium quality plastic loops that allow two-way adjustment. The brace fits users between chest circumference 31 inches to 51 inches and arm size between 9 inches and 16 inches. Its ergonomic design allows it to deliver gentle compression on your shoulder while not restricting motion. The package comes with a user manual. 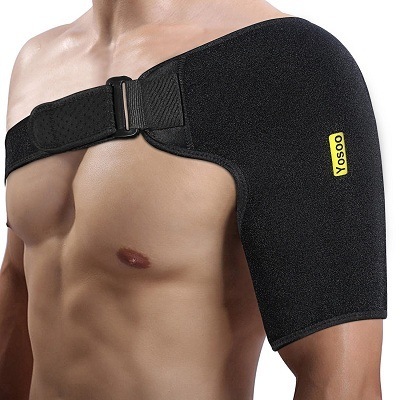 On Amazon.com the Yosoo Rotator Cuff Shoulder Brace has received a lot of applause from reviewers thanks to its simple to use construction, its great price, its adjustability and its comfortable fabric. Reviewers, a couple of them, have a problem with the brace’s sizing which does not accommodate those with small shoulder and plus size individuals. 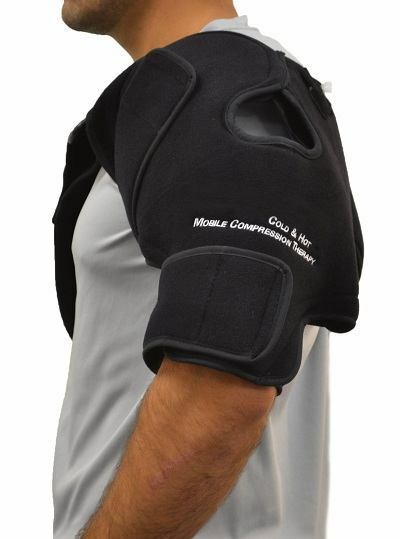 Shoulder Wrap for Hot or Cold Shoulder Brace is created to offer ice therapy to ease the pain on an injury and thereafter heat therapy to hasten the process of recovery. It is a simple therapy wrap designed lightweight and easy on the skin of the user to enhance comfort while managing pain and injury on the shoulder. The brace comes with patented heat and ice packs; these packs can be heated or chilled to offer heat or cold therapy. Users can buy replacement packs. To offer a custom fit, the brace is designed with adjustable compression straps; this enables the brace to accommodate those with chests between 40 inches and 52 inches. 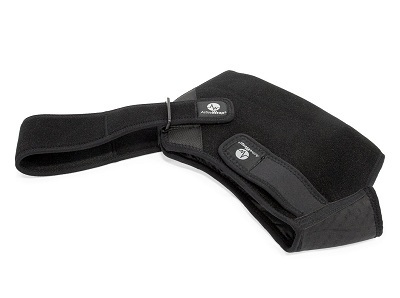 Patented Active Medical Plush material enhances the brace’s comfort and makes it easy to wear. 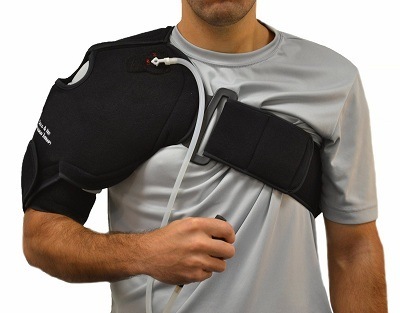 Based on the reviews on Amazon.com, there is no better brace in managing rotator cuff injuries. The hot/cold and compression therapies that the brace offers make it popular among many athletes. There are complaints, however, on the strong chemical smell the brace produces in the first few days of use and the one-size-fit-for-all that does not accommodate children and plus-size individuals. There are a number of reasons why you need a shoulder brace. Mainly, you need it for protection, for injury rehabilitation, for support during training or exercise, for pain management, and shoulder compression among other health benefits. With the best shoulder brace, your shoulder will be kept in position protecting it from strains and sprains. Again, the range of motion is restricted and chances of your shoulder dislocating are minimal. Shoulder braces offer therapeutic heat to the shoulder joint enhancing blood circulation. Again, they support shoulders and the spine relieving the user of neck and back pains to relieve you of any pains and discomfort associated with shoulder. The resistance that the braces offer makes the muscles work harder against the straps. In the process, the muscles are strengthened. Shoulder compression enhances skin receptors which send messages to the brain creating more awareness on the position of the affected area. Support can be basic, moderate or high. Braces that offer the right support are small in size, are created from stretchable light fabrics and are adjustable. These braces are generally comfortable and can be worn for long periods. High support braces are mainly worn by patients recovering from surgery and who need maximum support. Medium support braces are common with athletes. These cover a large area of your shoulder and are made of a thick fabric. 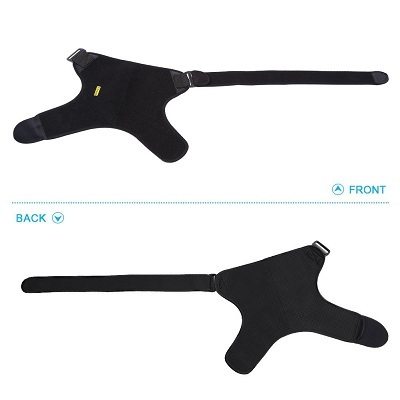 When choosing a shoulder brace, consider the width of the straps and where the straps pass. Also consider the material of the strap. Neoprene is a good stretchable material but it makes you sweat during hot weather. Most shoulder braces are designed with adjustable straps which make them fit a wide range of users. However, just because a brace is adjustable does not mean it can fit you. A custom fit brace will offer maximum support and give you all the benefits of a good brace while an improperly sized brace will be a discomfort and will offer minimal or no support. 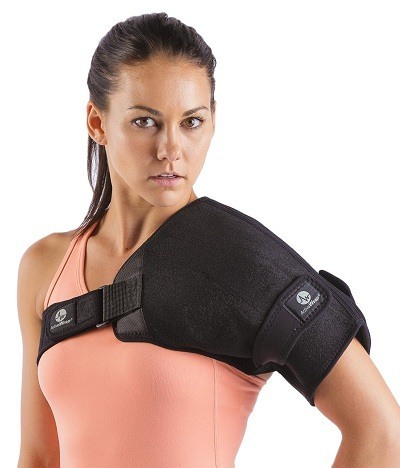 If you are an athlete, you will wear a shoulder brace for a long time and as such, you need one that is stylish and comfortable on your shoulder. Choose a brace that is not bulky and whose color does not show under other clothes. Choose one that is easy to wear, easy to wash and, in case of hot/cold therapy braces, one that is easy to assemble. People wear shoulder braces for different reasons. Manufacturers create braces to meet the different needs and as such, you only need to buy a brace designed to help in your injury pain of shoulder joint condition. There are braces designed specifically for shoulder rotator cuff, others for shoulder joint injuries and others for arthritis and other chronic shoulder conditions. Check manufacturer’s specifications to know which fits you best. S﻿﻿tudies on hot and cold therapy has been proven effective in acute pain. It is best to know whether to use hot or cold therapy on different situations. If there is swelling, or redness, use the cold therapy. 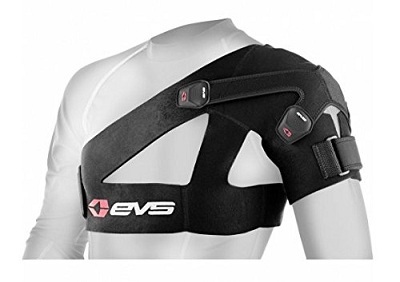 Of the four shoulder braces reviewed above, EVS Sports SB03 Shoulder Brace is our favorite. It is designed with a great support-comfort balance and its design gives it the ability to help with many shoulder joint issues. Unlike other braces where one size fits all, the EVS Sports SB03 Shoulder Brace is offered in four sizes accommodating small sized people and plus size individuals. Its breathable material keeps it easy on the skin and cool during hot weather. Again, it is stylish, less bulky and offered at a reasonable price.